I'm in the process of assembling a touring bike. I need to better understand the risks of using ~5cm worth of headset spacers in-between the stem and headset. I weigh 205 lbs, I am 6'4"
for limits on separately purchased forks." But, they don't state that a rider can't do it, or shouldn't do it. I've had 7cm worth of spacer's on my street single speed for almost a year. I treat it with respect but I ride it pretty hard. I haven't noticed any deformation of the headtube, steerer tube, or headset... yet. I need the ~5cm worth of spacers in order to achieve a 2cm handlebar over seat position; a nearly ideal position according to a fitting process I went thorough. I'm planning on riding this bike aggressively and hard at times. What does it take to deform a headtube, steerer tube, and ruin a headset? Any other tall, big, and heavy riders who use a lot of headset spacers on their bikes? If you need to raise the bars that much, why are you only using a 17 degree stem? Throw a 45 degree stem (or more like an adjustable) and ditch most of those spacers. Your fork will thank you. 1st time i hear about that rule?? I figure that it's ok to use the entire length of the uncut fork; and plan on doing so with my new tourer. Why would the manufacturer make a steering tube that is longer than you can safely use? More money to make, more lawsuit risk, etc. Without looking it up, I recall that Sheldon had an older bike with uncut steer tube. He wasn't even bothering with spacers--just a lockring right above the headset and then the stem mounted several inches above on the bare steerer. Wouldn't win any beauty contests, but safety was never questioned. The uncut steerer (typical length 300 mm) is provided so the fork can be used on large frames with long head tubes, not specifically to let you put a huge spacer stack under the stem. A 62 cm frame could have a 220 mm headtube so allowing for a 30 mm headset stack height and 40 mm for the stem, that leaves only 10 mm of room for spacers. That said, a 1-1/8" steel steerer should tolerate a rather large spacer stack with no problems. Easton allows up to 50 mm of spacers with its 1-1/8" CARBON steerer tubes, and steel is even more forgiving. To the OP: I'll second joejack's question about your stem angle . Is the "17°" stem installed so it's level or so it's angled up? If it's installed level, you can gain significant height by flipping it over so the angle is up. If it's already installed that way, I agree, you need a higher angle stem or an adjustable one. One big advantage of threadless steerer tubes is that fork manufacturers need only make one fork with a steerer tube long enough such that it fits all reasonably sized frames. with threaded steerer tubes, the tubes had to be threaded to the appropriate point for the frame size (to avoid lots of unnecessary threads, a hassle for manufacturing) so many fork sizes were needed. With threadless, the excess length is simply cut off and discarded. Interesting, where is some more data about this? anybody knows? Data about what? Maximum spacer stacks? The only published data I know come from carbon fork makers and the typical recommendations are no more than 25 mm of spacers below the stems of 1" carbon steerers (Reynolds) and 40 mm maximum for 1-1/8" carbon steerers (Reynolds) or 50 mm max (Easton). The 40 mm maximum recommendation for a 1-1/8" steerer steel fork the OP mentioned is new to me. "Threadless forks are generally supplied with very long steerers, intended to be cut to appropriate length for various different bike frame sizes. If you are buying a new fork, or a new frame, you can leave the steerer full length even if you ride a smaller frame. This will let you get the stem nice and high without needing any extra accessories. On some of my own bikes, I've gone this route, and have used a separate clamp to secure the headset, rather than using the stem for that purpose. A 1 1/8 steerer is 28.6 mm. Pinch-bolt type collars are readily available in this diameter, some of them intended for seat tube use. Using the separate collar allows you to mount the stem anywhere on the extended steerer, without any need for spacer washers, and without any need to re-adjust the headset every time you raise or lower the stem." To the OP: I'll second joejack's question about your stem angle . Is the "17°" stem installed so it's level or so it's angled up? I'd like to reiterate that this fork is very nice, it's designed to last. I'm not excessively concerned about this situation, but the manufacturer said what they said, so I believe it warranted an investigation. I could see a strong argument here (as in, don't take the risk) if it solely pertained to bikes that were designed to take a lot of hits, like mountain bikes and BMX bikes, but I would never ride this touring bike that hard. I forgot to mention that I have a cable hanger positioned 1.5mm (a spacer took up the gap) above the headset; it clamps down onto the steerer tube. This is in line with what Sheldon Brown talked about. Thanks for the posts. Anymore feedback? Sheldon's recommendation is probably ok but I wouldn't leave a full length 300 mm steerer on, say. a 50 cm frame with a 100 mm headtube. It would look, and maybe act, too much like a spear! Also, Sheldon's technique would require a BIG stack of spacers, at least temporarily, to set the headset adjustment before tightening the pinch-bolt collar to lock the adjustment in place. An extra 10mm spacer on a 1-1/8" steel steerer? Don't worry about it! Think of it this way, it doesn't really matter whether you raise the stem 5mm on the steering tube or use a steeper/longer stem. As long as the handlebars end up in the same position, all of the max torques on the steerer (at the headset) will be the same. Dont believe everything you read on Sheldon. So you want to install 50mm of spacer and Gunnar recommends a max of 40mm. OK, you can either cheat an install an extra 20mm of spacers. Get a stem with more meat on the bottom or get a stem with more rise to it. How can a stem be recommended by your fitter if its doest give you the proper rise with the recommended spacers? Sounds to me that your fitter deosnt have the proper stem in stock. I think the application is an important consideration. Clearly I can get away with more on a street-bound grocery-getter than an mtb hurtling downhill through boulder-strewn gullies. Common sense and paying attention to how my application is behaving under its load should guide me successfully. Last edited by ClarkinHawaii; 05-05-10 at 07:38 PM. ....How can a stem be recommended by your fitter if its doest give you the proper rise with the recommended spacers? Sounds to me that your fitter deosnt have the proper stem in stock. Re-read his first post on that part. The shop didn't recomend a specific stem. Just he's trying to get the bars up to 2cm above his saddle height using the stem he's got. I'm with those that suggest using a stem with more rise angle. Get a 30 degree stem and you can even reduce the number of spacers to less then 40 mm's. Whatever gets the bars up to the right height and distance in front of the saddle is good. Even then I'd tend to leave the stem a little longer and stick a spacer or two up top. Try moving the bars up and down in different combos 5mm at a time and see what you finally find to be the best for you. Racing fits done by good fitters seldom need any tweaking and if they do it's seldom by much. But for longer touring rides you may find that fudging things around to a greater degree will provide more comfort or effectiveness for longer days. Even to the point where if you know it's a lot of uphill for that day you may want to drop the bars by a cm for a slightly more aggresive fit for the demands of the day and raise them for more comfort if you know it's mostly level or down for the day. Re-read his first post on that part. The shop didn't recomend a specific stem.
. Regardless, as mentioned, it needs a different stem. LOL! My bad. I didn't even bother looking at the equipment list. I just read the text parts where he mentioned trying to get the bars up to the right place. A reasonable attitude but it doesn't make sense to use a shallow angle stem and a bunch of spacers when a steeply angled stem and typical spacers could be used instead, unless you had some other reason for wanting to leave the steerer tube long. If all he had was the 17 degree stem and didn't want to buy something else, that's one thing. But, the fact that's he's building the bike and has the oppurtunity to select a more suitable stem for the purpose of raising the bars, the 17 degree stem and long steerer make no sense. Throw a 45 degree stem (or more like an adjustable) and ditch most of those spacers. Your fork will thank you. Leverage is leverage, be it from spacers or a higher stem angle. She's got well over 10,000 miles of hard riding and not a hint of issues. Last edited by dobber; 05-06-10 at 04:57 AM. 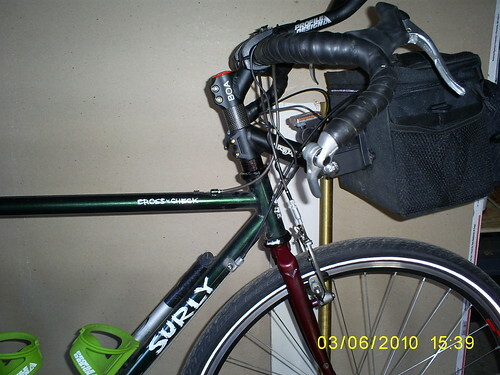 I just built a Surly Crosscheck and I'm presently running 6cm of spacers plus the brake cable hanger. I'm sorry, but it feels as stiff as anything. Also, when I installed the fork I cut about a quarter inch off the top of the steer tube. Based on how long it took me to cut it, I think that a steel steer tube is going to be able to hand about as many spacers as you can fit. I also was in a shop where they had a number of Long Haul Truckers with equally tall stacks. And I'm sure the Gunnar frame is a lot like the Surly in terms of bombproofness. True, if you are only considering points shared between the two setups, such as the spot where the higher angle stem is clamped to the steerer tube and where there are spacers with the lesser angled stem. But you are neglecting all that extra steerer tube above the spot where the higher angled stem is clamped (and which doesn't exist with that setup). All that unsupported steerer tube is feeling something in order to transfer the load to the aforementioned shared point. I'm not saying it can't be done safely but why do it when there is an easy alternative?